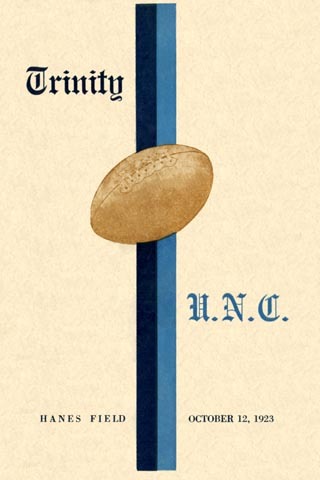 Fifteen years after Washington Duke began his Diogenean sit-down strike in search of a passing virgin, the newly christened Trinity College Blue Devils staged their first home game since 1893 against their once and forever Tobacco Road rival. The contest was held on the grounds now known rather inelegantly as "Williams Field at Jack Katz Stadium," behind the Broad Street Wall, and was one of three Carolina games played on the site before the opening of Duke Stadium (now Wallace Wade Stadium) in 1929. At the time of this game, Hanes Field was also the home of the minor league Durham Bulls baseball team, but now its only role is that of hosting Big Time field hockey.